Long before I decided to write a book about the New Haven Independent, I knew who Paul Bass was. 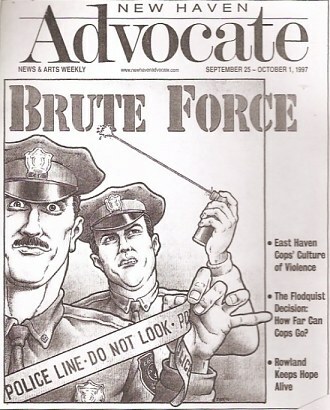 The New Haven Advocate, like The Boston Phoenix, was one of the crown jewels in the world of alternative weeklies. Bass, who spent much of his long stint at the Advocate as its chief political columnist, was something of a legend in that world. This week, about eight months after The Boston Phoenix died (survived by its sister papers in Portland and Providence), the Advocate breathed its last. In this case, there isn’t even a body to mourn, as the Courant absorbed the Advocate into a weekly supplement called CTNow. The Hartford Advocate and the Fairfield County Weekly are being subsumed into CTNow as well, according to this account by blogger and former Advocate writer Brian LaRue. Bass has written a heartfelt tribute to the Advocate and what it meant to New Haven — and to him. Among other things, he gets at something I’ve been thinking about: whether community news sites like the Independent are, in a sense, the new alt-weeklies — not as opinionated, not as profane, not nearly as far to the left, but nevertheless representing a type of journalism that is engaged with the community in a way that few daily newspapers are. I worked at the Hartford Advocate from 1975 to 1983, initially as the listings person (yes, I took the personal ads!) and then a columnist, arts editor, co-editor of the whole thing and co-editor of its monthly mag, before jumping to the Hartford Courant. The Advocate was my J school — a fascinating, frustrating, hilarious and sometimes horrifying place to learn the news biz. A priceless experience I still treasure. RIP, Advocates — you did a helluva job.